A Step-By-Step Guide to repairing and treating damp, rot and insect infestation in wooden windows and external timber, with a full explanation of the causes of damp and rot to timber windows and DIY advice on fixing the problem. What Causes Wooden Windows To Fail? The biggest enemy of all types of timber windows is water. When water is allowed to sit on the surface of the timber it can cause the fibres in the wood to expand and soften. This soft moist surface is the perfect breeding ground for mould, and insect attack, which cause rot. This rotting is a natural process, in fact it is nature’s way of recycling dead trees, which is very useful in the forest but is most inconvenient in your wooden window at home. 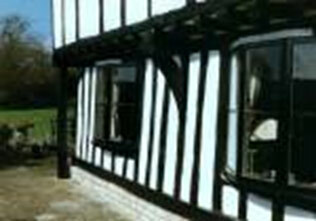 Traditional wooden windows have mouldings which are shaped so that all the surfaces slope slightly away from the window to help water run off the stools (external window cills or sills) rails, muntins (or glazing bars) and mullions This is to ensure that water will not pool on the wood, thereby preventing soaking the timber for prolonged periods. If, after reading this guide, you still feel you need some additional expert advice on timber preservation or repair you can call Property Repair Systems on 01626 336180. All advice is free of charge and comes with no obligations. There is water vapour in the air at all times, known as humidity, but rain is obviously the major reason our external woodwork gets wet in the UK. Add wind into the mix and the water can be scoured against your woodwork for much of the year, especially if you live in an exposed area. It is no surprise that wood and water do not mix, this is why when we use wood in external settings it always has to be protected either by painting, varnishing, oiling, pressure treating or other chemical preservatives. Occasionally the natural preservatives in the timbers themselves are utilised and may be simply oiled or waxed, or more dramatically by charring. Charring involves using a flame to burn the surface of the wood. The sap in the wood is forced to the surface, burns and blackens, forming a protective skin on the timber. Charring was commonly used in medieval timber-framed buildings in the UK, and charring timber cladding is a traditional method still used in Japan. See how charred timber is being utilised by the Japanese modern-day Architect and Historian Terunobu Fujimori in this Telegraph article. It is rarely used for preserving wooden windows, but an increased interest in this method may lead to more instances. If combined with Boron rod technology it could be a low-environmental-impact method of treating timber windows, and low maintenance too. Water gets into the timber either by driving rain or water pooling on surfaces. As mentioned above this leads to rot and even attacks by wood boring insects. This can happen on any type of wood, even treated timber if the treatment is only a surface treatment which does not extend all the way into the thickness of the wood. The wood in older buildings is most susceptible to penetrating damp, especially where the window frames sit on, or into masonry walls. Obviously the older the wood the more likely it is to suffer from rot. There are many ways of protecting timber from penetrating damp as mentioned above, but if the wood is already beginning to rot it is best to treat the timber with a boron treatment to stop the rot and preserve the timber against any further damage by water or insects. Older properties are particularly susceptible to the rot and insect infestation usually associated with dampness. This is because pre-Second-World-War properties did not have the benefit of modern day timber preservative chemicals, and solid walls (non-cavity walls) or thick random-stone walls support the frames. When these older houses were built they were constructed of building materials that more readily absorbed moisture than modern-day ones. This was not a problem at the time they were built because the moisture within the materials would have been wicked away by ventilation, simply by the way we lived at the time. However as we now centrally–heat our homes rather than using open fires, and we prevent draughts to save energy, our homes are ‘breathing’ less. These solid walls are more likely to hold water, and transfer that moisture to the window frames, because they are built of these permeable materials, and are less likely to have a damp proof course (DPC). Modern houses are built with modern-day living practices in mind. They incorporate materials, like DPCs, that work by keeping moisture out of the building rather than the older practices of using materials that would absorb and evaporate moisture. Read more about Damp Proof Courses in DIY Doctor’s DPC Project. The effect of this constant exposure to water is to make the timber surfaces soft and spongy, which are ideal conditions for wood-boring insects and mould spores to thrive. A boron treatment will stop the rot, and prevent insects from destroying the window frame. 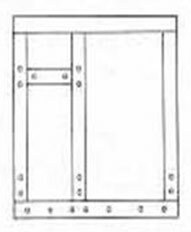 Historically, most timber window frames would be created using Mortise and Tenon joints, with wooden pegs (dowels) or glue to secure them. 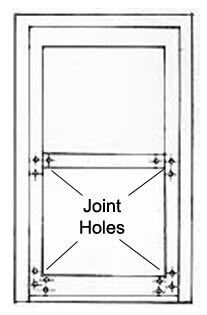 If you are not sure what a Mortice and Tenon Joint is you can see a video here. Unfortunately these securing pegs are prone to attack by woodworm, and once the joint structure has been damaged in this way it allows the frame legs to move, and the joints then open up. This exposes the ends of the wood to the elements. There is a double whammy in terms of damp penetration here, because the surfaces that are now exposed have not been treated with any sort of protection or preservative, and will be in a place where moisture can collect and not drain away. 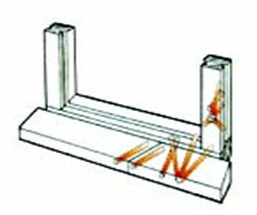 This problem can be repaired by replacing the damaged pegs with epoxy-glass tie bars, and repairing the damaged timber with injected resins which are available from Property Repair Systems along with many other damp treatment products such as boron rods, and resins for timber repair. Boron rods work from inside the window frame. They are placed into holes drilled into the timber where they work by gradually dissolving to kill the rot inside the wood. Boron paste is also available and can be painted onto drier areas of timber as a surface treatment preservative. Press the surface of the wood with the point of a screwdriver, the wood should be firm, if it is flaky or spongy it is in danger of deteriorating. You can also carry out further inspection by drilling onto the timber with a 10 mm auger to see how far the problem has penetrated into the wood. Rot and insect and infestation should be treated immediately to prevent further damage to the timber. We have been talking about window frames so far but of course external door frames are also prone to damp, decay and insect damage in exactly the same way as windows. Treatment of these problems is the same for windows and doors. There are modern treatments to protect and treat timber from damp, once the problems have been diagnosed, and you may prefer to treat and repair your windows rather than go for the option of replacement windows. Treatment is a DIY project providing you have a few basic skills. In this project we are explaining how to treat the timber with Boron products which dissolve into the timbers themselves. The repairs in this guide are explained using epoxy resins rather than splicing-in timber, which is a traditional repair method for timber. Splicing is a perfectly good repair for damaged timber but it does leave a weak spot and it is a harder DIY job. With traditional splice wood repairs you need to get a really tight fit to prevent exposing your timber to moisture again. Using resins is a simpler and more long-lasting solution to replacing section of damaged wood, and is easily carried out for a Do It Yourself enthusiast. You can still fill larger areas with a piece of timber cut smaller than you need and fixed to the existing wood using resins, which will give you a good seal and you do not need to be so precise on cutting in the replacement timber. Treat: Once all the products you have used for your repair has dried and cured you are ready to treat the area with boron rods and gel paste, to make sure your wood continues to be protected from rot. The two elements work together with the damp in the timber to give ongoing protection from decay and insect infestation. Drill 10mm holes into the wood above and below the repairs. If you have an older property it is possible that the window frame has dropped at one end if it has become damp and compressed within a damp wall. This often happens where a wall has been most exposed to the weather or where land is not well-drained. Property Repair Systems have a patented Timber-Resin Splice Kit that can be used to make effective and long lasting repairs to timbers that have been damaged in this way. It uses simple and effective technology which is approved for use on structural and load-bearing timber frames. Even better, repairs can be carried out in situ. DIY Doctor has been working with Property Repair Systems for many years to bring you the best advice on treating damp, rot and insect infestation in timber and masonry. We hope this project has helped you sort out your problems if you have damp or rotting wooden windows. However if you need further help their expert staff will be pleased to give you completely free, no obligation advice. Just give them a call on 01626 336180. We have lots of other Window related projects in our DIY Projects Section.